This is the most famous Fujian-style soup. The original recipe was created in 1876 by the main chef at the Juchunyuan restaurant. It is not a simple homemade soup; it is extravagant and complicated. Up to 30 ingredients are used in the making of this soup. 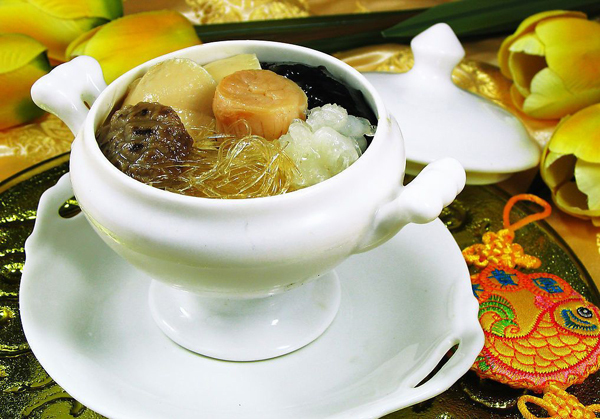 Among them, most of the ingredients are unusual and rare, such as abalone (a type of sea snail), Shark’s fin and sea cucumber. 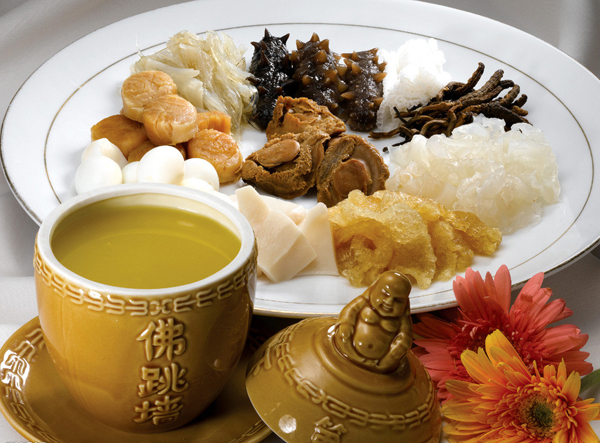 Other ingredients are also highly prized for this soup, including pigeons’ eggs, squid, good quality ham, scallion, chicken, duck stomachs, fish stomachs, pork, and particular types of mushroom. In fact, every restaurant has its own unique recipe for this soup and purposefully keeps it a secret. This dish is so delicious that supposedly not even Buddha could resist the temptation and so jumped over the walls of the monastery to get it. Thus it is called “Buddha jumps over the wall” and, for the same reason, is sometimes called “Buddha’s temptation”.